In 1957, I was 10 years old. My younger brother had a crystal set and I didn't. My parents realised this was an intolerable state of affairs, and when the Studio ‘E’ one-valver series began, the plans were sent for and my mother was dispatched to the local radio shop (R F H Porter, Guildford) to buy the kit of parts. The salesman was somewhat patronising, going through each component's characteristics and purpose in unnecessary detail. My mother, a State Registered Nurse, said indignantly: "Never mind how his radios ticked - I could have told him how he ticked!". 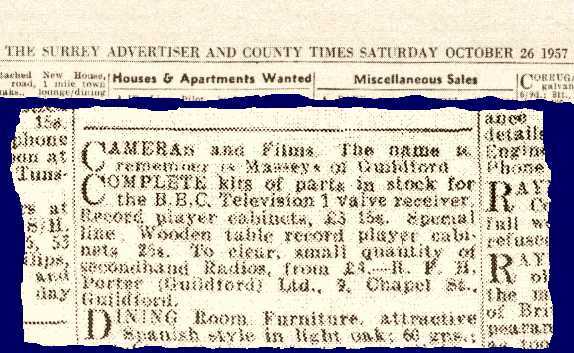 small-ad offering kits for the BBC one-valve receiver. Copyright © Surrey & Berkshire Media Ltd; reproduced by kind permission. Prepared from a British Library image, copyright © British Library Board: Shelfmark 476. I didn't really know how radios ticked either, and the leaflet didn't mean much to me. However, I noted the confident assertion at the end of the instructions on page 2: "Insert valve, connect aerial, earth, phones, battery; set now works". To this I added in a childish hand "WE HOPE!!! ", summing up both my anticipation and perhaps a healthy scepticism at such confidence. My Dad set to work and first built the chassis, not of plywood as many doubtless were, but of glossy brown Paxolin. This, set off by a couple of pierced aluminium brackets bracing the front panel, lent the whole thing a high-tech scientific aura that had great appeal for his 10-year-old client! As an afterthought, my father added a switch in the LT supply after consulting a knowledgeable relative as to whether this would also cut off the HT current. It only remained to rig up an aerial in the loft, run an earth wire behind the chest of drawers to the existing earth connection on my brother's crystal set, and deliver a careful warning to me about interfering with nearby listeners' reception with improper use of the reaction control. Mostly I listened to Radio Luxembourg, learning (along with the rest of my generation) how to spell K-E-Y-N-S-H-A-M, but I also remember listening to a Home Service drama series of "Lorna Doone", and a Children's Hour programme about the life of the civil engineer I K Brunel on the centenary of his death (1959). By this time, I had moved to secondary school (Sheerwater County Secondary, Woking, now Bishop David Brown School), and waited impatiently to join the Science Club, only open to Third Year pupils and above. My first project here was to add another valve to the one-valver to drive a loudspeaker (this would have been autumn 1960). I was assisted in this by the exceptional teacher who presided over the Science Club, Mr King. E V King was a prolific writer for Practical Wireless and other titles, so much so that he acquired two pen-names: G K Vine and K Given (anagrams of his name). His school lab was stuffed with Government-surplus equipment and components of all kinds. It seemed you could build anything there. It was my idea of Heaven. I made up a plywood cabinet to house the chassis, speaker, output transformer and battery. I got into a bit of trouble at home because I used some wood bought for another purpose, but both my parents agreed that I had made a good job of it, and my mother found a piece of fabric to cover the speaker aperture. By this time, transistors were becoming readily available, and Science Club members built transistor radios to Mr King's duplicated plans. More advanced Science Club members were still building multi-stage valve receivers to his designs. CONTACT ME In due course, I dismantled the one- (now two-) valver, thinking I'd use the parts for other projects. Unfortunately I never took any photos of the set either as originally built or as modified. I used a few of the smaller bits, but the rest languished in my spares box while I moved on to adulthood.